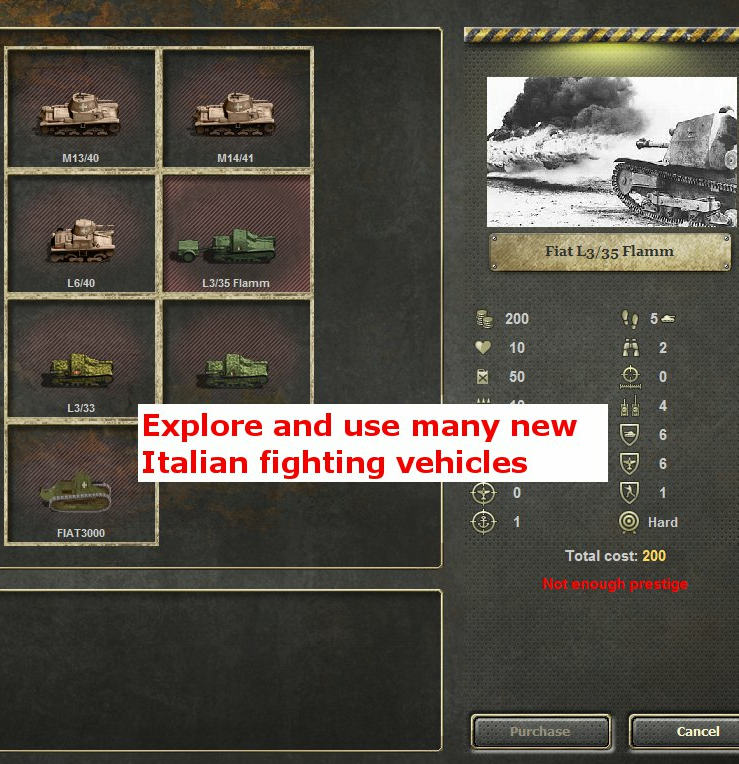 Uhu proudly presents the release version of the Italian Campaign 2.0 !!! Thanky you Nikivdd for the original campaign, for the later, new scenarios and for the inspiration! 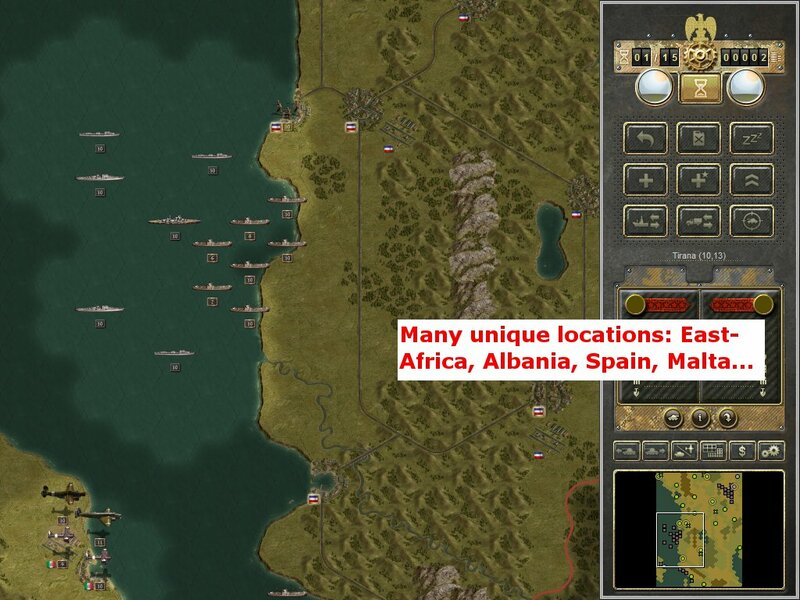 I announce official the making of a new version of nikivdd's great Italian Campaign (http://slitherine.com/forum/viewtopic.php?f=147&t=26888) - the Italian Campaign 2.0! 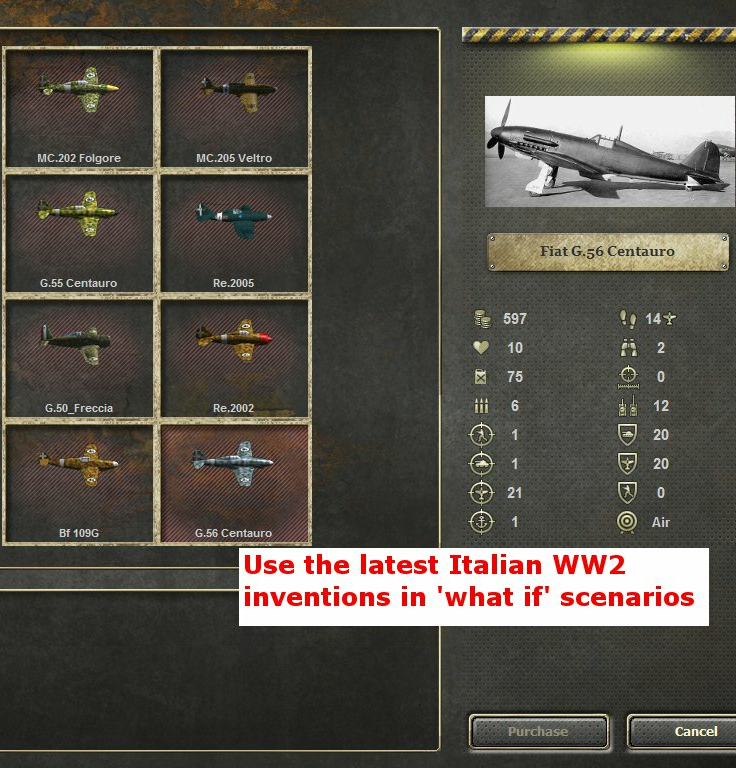 The reason for creating an another version was, that I wanted an Italian campaign, where the scenarios are more historical. 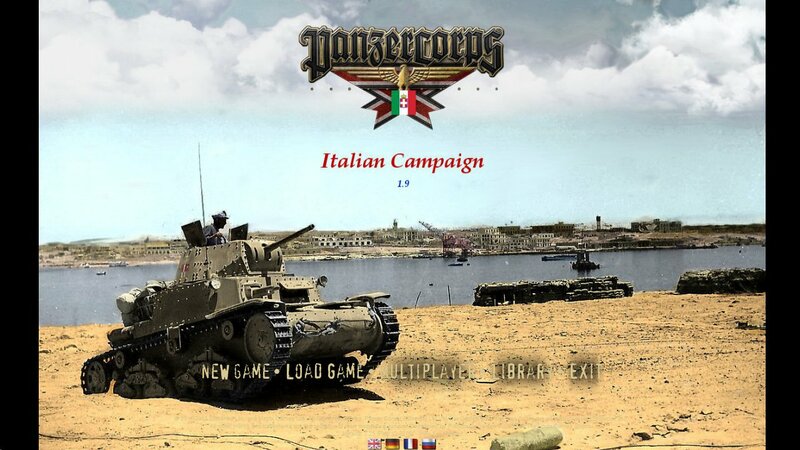 So, I first learned how to change auxiliary units (for example replace German units to Italians), but later, as I got the grip on the scenario editing and the game modding, many other features were changed to make the Italian Campaign 2.0 (referred IC 2.0) more Italic-style. - Many new scenarios were added (with the great help of nikivdd). 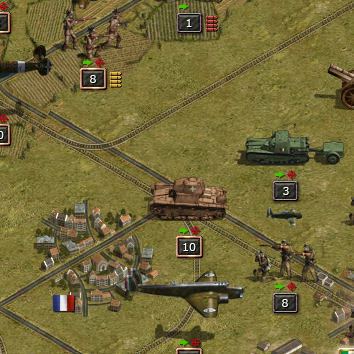 - Several new units were added, plus the older ones revised to make them more historical. 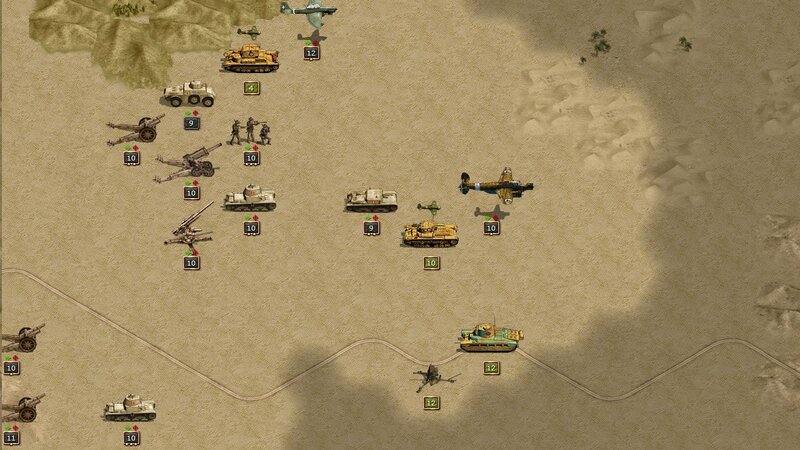 - The North African theater was added also to the campaign tree, because the DMP Team (maker of Afrikakorps, Winterkrieg and other add-ons) was so kind and allowed me to use the North African terrain, Afrikakorps scenarios and unit icons. - I tried to add some additional features to the campaign: they will be released here, from time to time. Last edited by Uhu on Fri Apr 06, 2018 3:56 pm, edited 35 times in total. When Uhu asked me to join him to make this mod, i didn't hestitate for a moment. Somehow i always had a weak spot for the Axis Minors (Augustin *wink* *wink*)and IC 2.0 just gave me the opportunity to help out in whatever way i could. From day one, it has been a great pleasure and privilege to colloborate with him. A colloboration is always a challenge, where individual ideas can vary from time to time, but the results we booked sofar, stand like Stonewall Jackson. 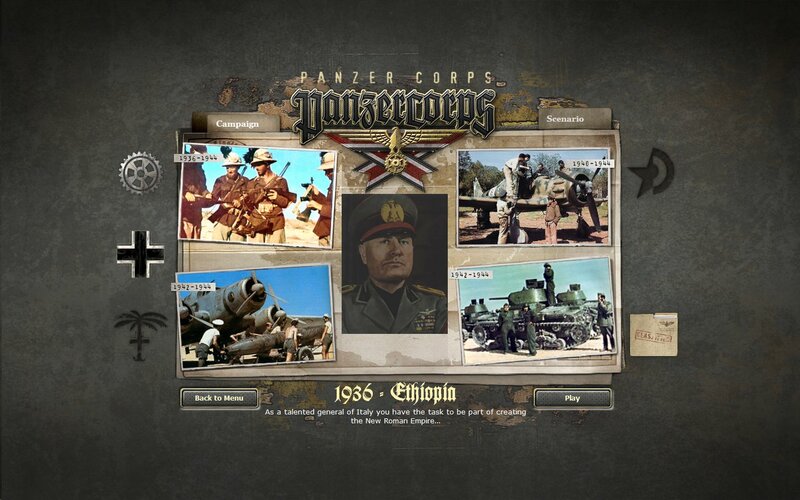 This mod will add a lot of hours of gameplay to the wonderful game Panzer Corps stands for. Uhu will make all further announcements and i hope when the mod is released, that many players will give it a try. Look forward to it as I did enjoy IC1! Thanks for the encouragement! Of course any kind of suggestions, critics (in cultured way) are welcome! Thanks Uhu in all your efforts. No hurry. It's ready when it's ready. The goal was to create an atmosphere, where the player feels like a real Italian generale, who get the briefing before the battle, plus informing him about the (semi-)historical events, which were happened in the meantime. The briefins are only in beta state: they have to be grammatically corrected to change the "Hunglish" (Hungarian language mistakes) in the text. Last edited by Uhu on Thu May 09, 2013 6:18 pm, edited 1 time in total. I just noticed that you've done a scenario about the Battle of Maychew (Mai Ceu). I'm just curious. 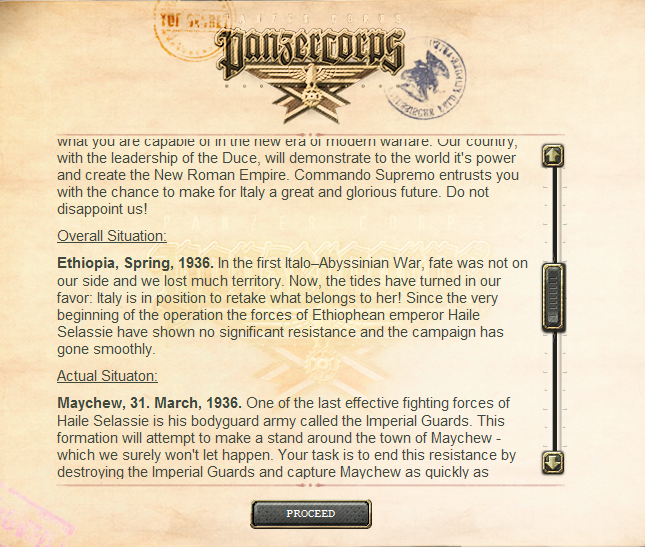 5 years ago, I've made a PG2 campaign (The War of the Negus) about the Italo-Ethiopian War. I can help , if you ever need infos about all the Ethiopian units or even all the Italian units that were part of this war. I own the book "Haile Selassie's War" "The Italian-Ethiopian Campaign, 1935-1941" by Anthony Mockler. Which icons will you use for the Ethiopians ? They were all Italian victories except for Battle for Burie and Debra Markos . Battle of Tembien was a draw. 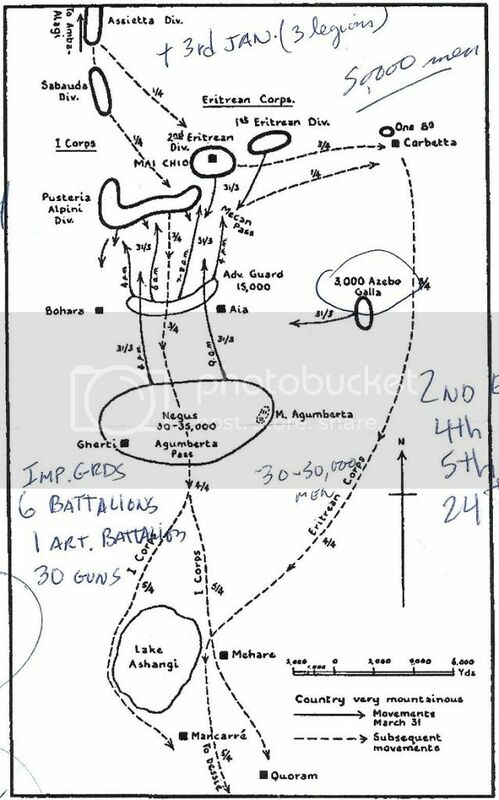 The Italians lost the most men at Battle of Gunu Gadu. Thank you, you are very kind! 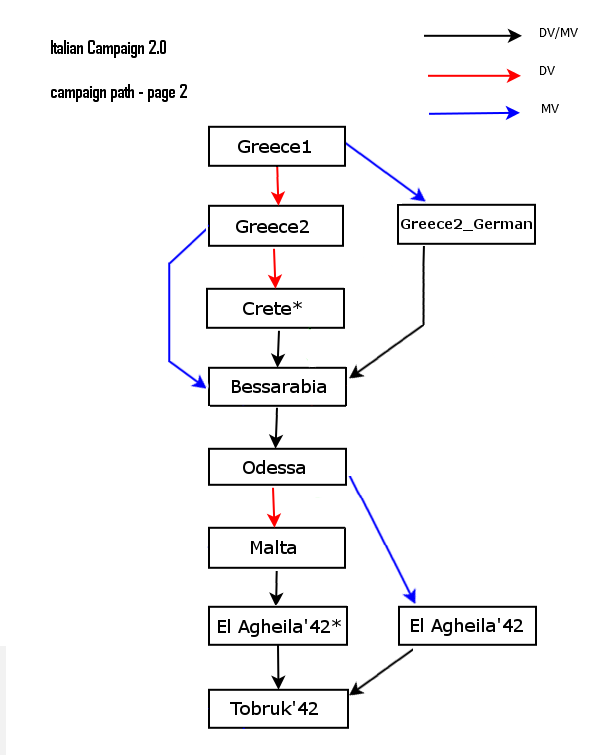 But I don't plan to make a complete Etiophian campaign - actually Maychew is a modified version of nikivdd's first, Elba campaign. I wanted to add to it some motivation (at least I was not motivated to play a friendly "match" against the German allies), therefore I searched a location and battle which could be implemented in the campaign in mostly historical way. 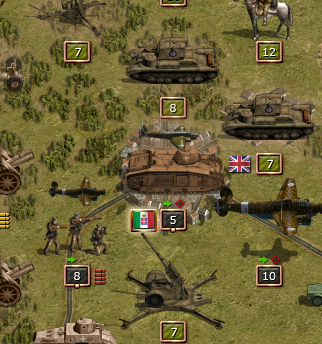 I made no extra icons for the Etiophian troops, because it was not needed: the heavy equipment is simply taken over from other nations, and because the Imperial Guards were dressed similar as the Belgian soldiers, therefore I decided to use the default Allied soldier icon. So, sorry, if this dissapoints you, but I promise: if you will play with the IC 2.0, the 24+ scenarios will bring much fun. AugustinMalar wrote: Hey guys ! When I begun to create the IC 2.0, I had largely an easy task with the unit icons, because most of them were already created by other modders. Unfortunately I don't know all the names of the creators, hopefully Nikivdd will help me on this. Many icons were taken from the DMP's Afrikakorps, as the guys where so friendly and gave me the permission for that. Still some additional units had to be created - not only for the Italian army but also for example for the Greek army. As I'm not a graphician, it became a challange to solve this problem. Bebro could help me on this by modifiing some Italian assault guns and the Bf109G, I'm very grateful for it. Some other minor changes made I myself: changing colors or changing the insignias. Editing the settings of the stats (where it needed) were a much more complex job: to keep on eyes on the balance, while triing to adjust a value, which represents at least largely the historian battle strenght and weaknesses of the given unit. What new units will be there? Many! I don't want to list them now (but I will do it at a later time), but I show some unit purchase pallettes, which shows not all avaible units, but many of them. Last edited by Uhu on Thu May 09, 2013 6:22 pm, edited 1 time in total. I'm looking forward to this one I played some scns of Nico's release, it was certainly a fun experience, and I think this version will be as well. Will you reveal the campaign path in a later preview (or had you already somewhere else?)? That would be quite interesting....In ca. 2 weeks or so when I'm hopefully through with the recent USMC version I could also offer some more gfx help in case you still need something. bebro wrote: I'm looking forward to this one I played some scns of Nico's release, it was certainly a fun experience, and I think this version will be as well. After the initial release, we are not considering it finished ofcourse but that will depend on the responses. I will reveal it later. This is an interesting mod and campaign. I wonder if the Ethiopians had any spear chunking assault squads. Shame on Mussolini! 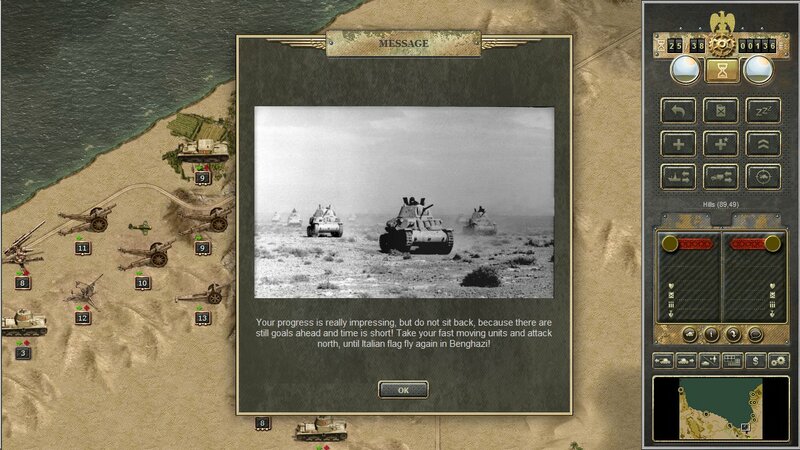 Many regions could be familiar from the original Italian Campaign, but there will be some others. East Africa is one of them, North Africa, with the DMP scenarios will play also a major role, Sicily, Italy, Gibraltar and England will be on the list too. The campaign will not always be linear, so if the player makes DVs, sometime he will be "rewarded" with bonus maps and there will be a "defense/withdrawal" path too. Last edited by Uhu on Thu May 09, 2013 6:24 pm, edited 2 times in total. That's a very interesting list. Since it's "regions", not scns I understand some regions will have offer than one scn - that makes certainly more "appetite"
Good point! Exactly that will be the situation. bebro wrote: That's a very interesting list. Since it's "regions", not scns I understand some regions will have offer than one scn - that makes certainly more "appetite"
If the player makes at certain points DV's, than the total scenario number will be 24. In all, the IC 2.0 will contain 28 scns (at least at the first release. ). To control the 'more scns-more experience' issue, the xp growing has been also altered. - There are some scns, which are bonus-scns (like the Norway scn in the Vanila campaign). 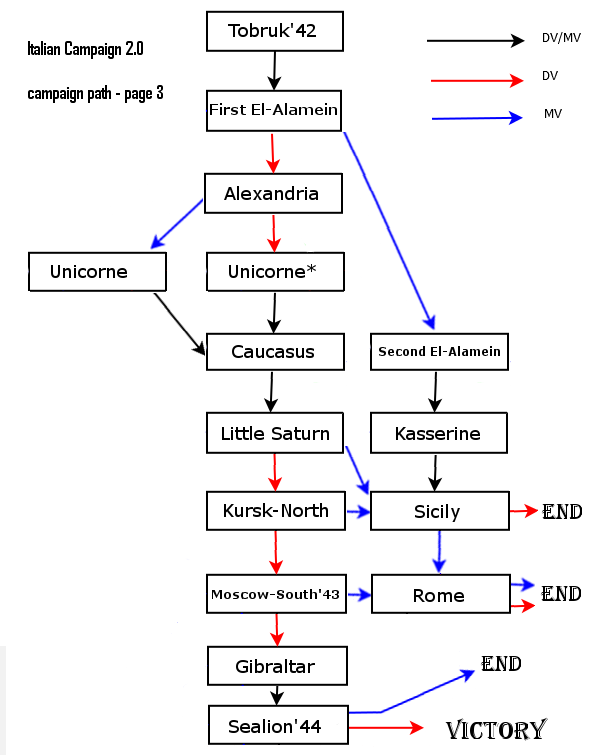 - There is also a loosing/more historical path: if the player cannot make a DV at First El-Alamein, than he can not advance further east, instead he will step on the 2nd El-Alamein-Kasserine-Sicily-Rome path. - If the player cannot make a DV at Little Saturn, he will join this path from Sicily scn. - "What are the "*" marks at several scns?" - probably you ask. Well, that will be explained in the next post. Last edited by Uhu on Thu May 09, 2013 6:27 pm, edited 1 time in total. Because I dislike the original SE Units system, where player get bonus units on random base (which deeply effects also the gameplay balance), I implemented an another option: the Gift-Units. What does it mean? 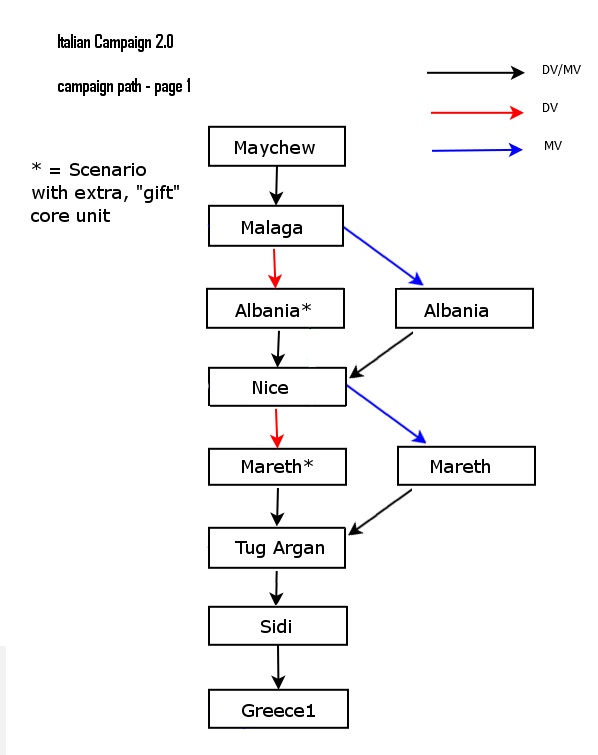 In several scenarios, if the player acts well and make a DV (at Malta it would be an MV enough), in the next scenario he will receive a bonus unit, as a gift. Many times, it will be a very powerful unit, so it is useful, to make a DV. But that does not mean, that without it, you cannot win in the next scenarios! (Maybe on Mannstein, Rommel level, it could be a problem... ) Other times, it can be a normal unit, or a unique unit, which, if you are not satisfied, you can also sell, than you will have some extra prestige. But units, what the player get, are never obsolote, weak units. There will be always a realistic (or at least beliveable ) explanation, why you get them - they are not falling from the heaven. Last edited by Uhu on Thu May 09, 2013 6:31 pm, edited 1 time in total.